It is true that the Governor’s budget proposal reinvests in some programs and services to achieve an overall increase in General Fund appropriations. This reinvestment was made possible by improvements in the availability of revenue under current law, the reliance on tuition increases and fees, as well as reductions in other areas of the budget. However, state investments in most areas of the budget are failing to keep up —let alone make progress back to pre-recession levels of spending. There are two primary vantage points for analyzing the Governor’s budget proposal and making comparisons over time. One method is to measure his proposal against the current law budget, which reflects the actual dollars that were appropriated last year per the final FY2012-13 budget. The other method measures his recommendations against the continuation—or base—budget, which reflects the dollars needed in the next year to maintain current service levels. The latter comparison provides a better sense of what is necessary to maintain residents’ current experience of public service because it accounts for the changing costs required to deliver the same level of services approved by the previous General Assembly. 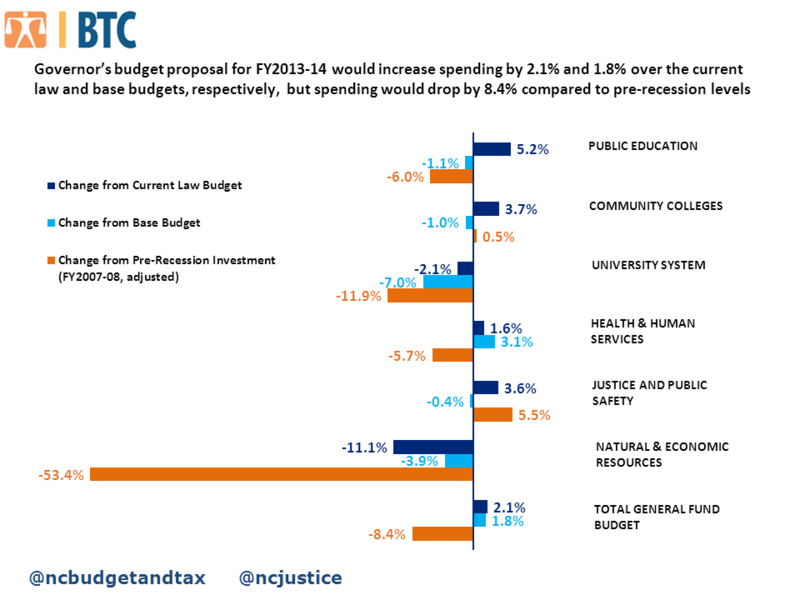 The chart below contrasts the Governor’s budget proposal to each of these vantage points. The reality is that with a diminished baseline, comes diminished expectations. For this reason, it is critical that we recognize that the Governor’s proposal may invest more than last year’s budget in pure dollars but it still falls short of what is needed to maintain current service levels for several major agencies in the budget. And nearly four years into the economic recovery, the Governor’s budget proposal falls far short of restoring the damaging cuts from the Great Recession and rebuilding the foundation for sustained economic growth. Without a detailed plan to address the revenue side of the Governor’s proposal, it is also unclear how this budget would rebuild a structurally sound foundation for economic growth.